If we’re preaching to the choir, why are they still singing the wrong tune? If you are a up to date, #FOAMed positive practioner, I suspect you already have strong opinions on the matter of antibiotics for sore throat. There has been a wealth of research and blog posts and podcasts on this subject already. However this study from the BMJ caught my eye this week and I thought it warranted a look. This was a big (n=14610) prospectively collected cohort study. 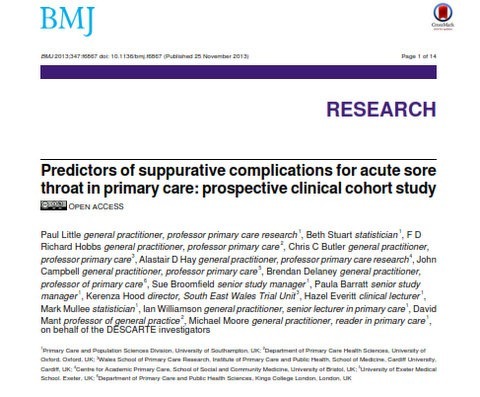 Adult patients with acute sore throat were recruited from primary care in 6 cities in England and Wales. The aim here was to identify clinical features that could predict the suppurative complications of sore throat, specifically otitis media, sinusitis, quinsy and cellulitis. They also looked at two risk scores – CENTOR and FeverPAIN to see how they fared in predicting complications. Complications are rare, like, really rare. Otitis media occurred in 0.52% of patients, cellulitis in 0.15%, sinusitis in 0.29%, and quinsy in 0.35%. These are low numbers, and without going any further you will know that trying to predict such rare outcomes is going to be difficult. However, while the OR’s for complications were enough to reach statistical significance, these earache and severe tonsillitis were of limited use in predicting complications, with PPV’s of only 3.75% and 2.27% respectively. The two tonsillitis score fared equally poorly at predicting complications. While specificity was reasonable at high cut offs for both FEVERpain and CENTOR, the PPV’s were terrible. This is the result of applying a test with a reasonably high specificity to a rare condition; even though the specificity is high, the any positive results is likely to be a false positive due to the low prevalence of complications. This illustrates the advantage of looking at PPV rather than specificity, the PPV takes into account the prevalence of our condition in the population. To use the classic example; this is comparable to using a d-dimer in a very low risk population (like our PERC -ve patients), any positive result is likely to be a false positive simply because the condition is so rare. All of this sounds very clever, but somewhat of a moot point if predicting complications doesn’t change our practice. The authors looked at the rates of complications in those prescribed antibiotics, given a ‘delayed prescription’ and those who got no antibiotics. They found no difference; no reduction in incidence of quinsy, otitis media, cellulitis, or sinustitis. This may come as little surprise to you, as accepted practice does seem to be changing to favour no antibiotics for treatment of sore throat. The updated Cochrane review did find a reduction in suppurative complications with antibiotic use, but the incidence of these complications was extremely low, consistent with what we see in this new article. For a more in depth discussion of this, you should listen to the Smart EM podcast on the subject. If not for reducing complications, why are we still giving out antibiotics? 62% of patients in this group recieved a prescription. So, if not to prevent these complications, why are we so attached to this practice? Remember that antibiotics have their own burden of adverse effects, from GI symptoms to anaphylaxis. Symptom relief? Having tonsillitis isn’t much fun, and trying to relive symptoms is a valid aim of treatment. Antibiotics may reduce the duration of symptoms (see the Cochrane review), but we do have other options for this (NSAIDs, steroids). The non-suppurative complications, the most feared of which is rheumatic fever. This is an extremely rare complication, and preventing it is probably not a valid reason to treat with antibiotics, at least in developed countries. The Smart EM podcast linked to above covers all of these points in exhaustive detail. These complications are extremely rare. The group that got antibiotics were just as likely to develop complications as those who did not. Is this going to drastically change my practice? No, I’m already a staunch believer in ibuprofen and a single dose of dexamethasone anyway. That said, my practice might be different if I worked with a population where rheumatic fever is more common. always an interesting and controversial topic. re symptom management, what’s your take on giving dexamethasone without antibiotics? I recall most of the data on the benefits of steroids where when given with antibiotics ie they compared antibiotics to antibiotics + steroids. Do we even know if it is safe to give steroids without antibiotics routinely? Also I wonder if while NSAIDS might have similar benefit to antibiotics at symptom reduction, what about the combination of NSAIDS, antibiotics and steroids? This may have additive or synergistic effects but I’m not sure it that has been studied. Great question, and one which I think we do not have an answer to yet. The Cochrane review on steroids in sore throat includes 12 studies. Of these, 3 studies (Bulloch 2003, Kiderman 2005, Olympia 2005) gave steroids to patients (about 180 altogether) without antibiotics if they tested negative for GABHS. While no evidence of adverse outcomes with steroids without antibiotics was found – this small, heterogeneous group of patients cannot assuage concerns re increased rates of recurrence or suppurative complications. Interestingly, one study (Olympia et al) found that patients who were GABHS -ve (and got no antibiotics), had a greater response to steroids and did better, while another (Kiderman et al) found the opposite. Try to answer one question, find a dozen more….. Thanks for the comment, and a Happy New Year!